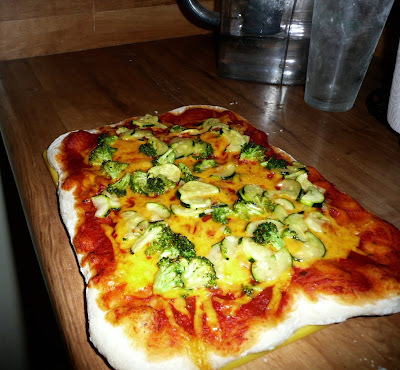 i made this the other night - broccoli and zucchini pizza with cheddar and parmesan cheese. trader joe's pizza dough is a terrific invention. This is kind of a silly question, but I probably go to the Trader Joe's right around the corner from you (2nd and PCH) and everyone I know talks about that awesome pizza dough, but I can never find it! Where on earth is it located? TJ's pizza dough is such a wonderful thing! And your pizza looks delish! ha, brothers are the best! I just looked up Trader Joe's. The closest one to me (Orlando, FL) is in Atlanta, GA! Thumbs down. I'm so jealous. Grocery stores in Oklahoma are terrible. No Trader Joes and no Whole Foods. looks delicious! i'm always looking for ways to incorporate more vegetarian options into my diet, and I think I may have to try this one! Pizza with raw zucchini slices is the beeeeeeeeeest! I read 'Trader Joes' and almost cried. I miss that store more than anything about Cali. The pizza looks delish! That looks delicious and now I'm starrrvvving! Haters, back off! YUMMMMMM!! That looks out of this world!! I think it looks divine! And I wish we had a Trader Joes in Utah. Blast! We miss out on all the good stuff. I really love their pizza dough too! pizza looks yummmmmmy! love your blog btw! he's missing out if he thinks that's gross! it does look very much divine as well as healthy! did you make the pizza sauce too? your bro is missing out! that pizza does indeed look very divine and healthy to boot! did you make the pizza sauce yourself? I too love Trader Joe's...but when I tried the pizza dough it didn't cook all the way through. Do you put it in the oven without any toppings on it first? I cooked it on a stone...perhaps next time I will try a regular ol cookie sheet. PS: I think your pizze looks divine! it looks heavenly! i am a broccoli fiend! now that you and naomi have both recommended trader joe's pizza dough i'm going to have to try it. i've never had anything from trader joe's before, but your pizza looks just DELICIOUS! My fave pizza from back home is Chicken and Sweetcorn. Try that combo next time. It's heaven. What is he talking about? That looks delish! I need to pick up some of that for dinner sometime soon.